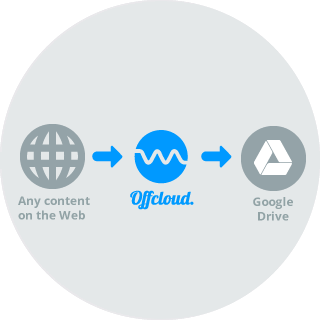 With Offcloud, you can send data from the web to your Google Drive. If you are a fan of Google’s cloud storage solution, Google Drive, you will be happy to know that Offcloud features a remote uploading functionality that enables you to directly transfer data from the web to your Google Drive. Offcloud’s remote upload capability to cloud storage services like Google Drive in combination with its ability to fetch a variety of formats makes it the ideal downloading companion for people on the move. Now, with Offcloud's premium access to all the major downloading and streaming websites, like Rapidgator and Uploaded.net, and its support for a variety of formats, including HTTP/HTTPS/FTP & BitTorrent, downloading has never been as simple and convenient. Connecting your Google Drive account to Offcloud has never been easier. Simply go to your settings page and click on Add New Account under Remote Accounts. From there, you just need to fill in your Gmail address and all will be set. After connecting your Google Drive account with Offcloud, you can submit any links pointing to online content to Offcloud and we’ll do the rest. We will use our dedicated servers and broad bandwidth connections to download the content directly to your Google Drive. This way, Offcloud does the heavy lifting in the backgroud and empowers you to continue your business with Google Drive as your main cloud storage service. You will no longer be forced to juggle between different drives, as your Offcloud downloads will be stored next to your other files on Google Drive. You can use Offcloud to upload content to your Google Drive for FREE. With a free account, you can submit up to 3 links. Then, you can enjoy the service without any restrictions for just $4.99 per month.